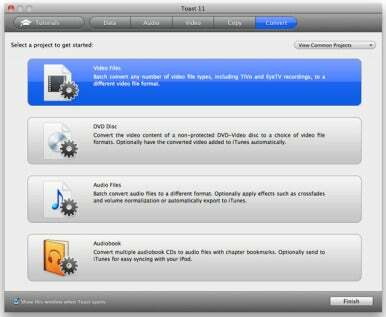 On Tuesday, Roxio released Toast 11, the latest version of its $100 CD/DVD burning and video conversion software. Big changes include a new user interface, built-in tutorials, multiple burner support, subtitle suport, and hardware-assisted video encoding. 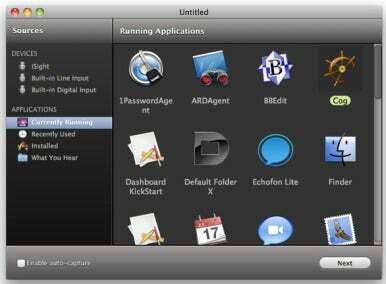 A new installer signals a shift in the way the software handles installation and updates. The new UI makes it easier to choose a category, incorporates the Media Browser, and adds useful burning settings to the main window. The Assistant window can show you common projects for a category, or all the available options. The VideoBoost feature can speed up H.264 video encoding using supported Nvidia graphics. A new feature called VideoBoost can take advantage of the GPU in some newer Nvidia graphics chips/cards to speed up H.264 video conversion. 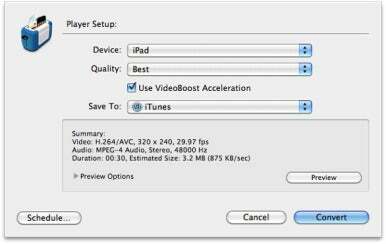 If your Mac supports it, a Use VideoBoost Acceleration option will show up in the Player Setup window. (My iMac with Nvidia GeForce 8800 GS graphics isn’t supported.) The speed benefits should be similar to using the $100 Elgato Turbo.264 HD ( ) USB stick (and in case you were wondering, you can’t use both at the same time). 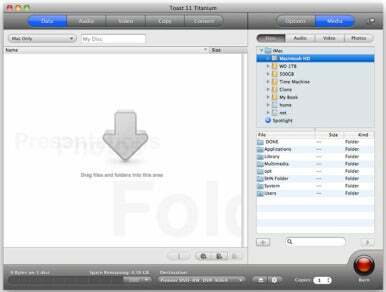 Spin Doctor (formerly CD Spin Doctor) can now capture audio from individual apps. 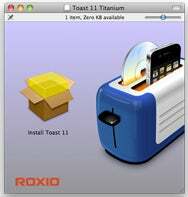 In addition to the standard Toast 11 Titanium, Roxio also offers Toast 11 Pro, which includes all the same things as Titanium but adds the HD/BD plug-in, a full version of Adobe Photoshop Elements 9 ( ), FotoMagico 3 RE, SoundSoap 2 SE and the SoundSoap Audio Units plug-in, and Sonicfire Pro 5. Elements 9 is $99 by itself, so if you don’t have a copy yet the bundle is a really good deal. Toast 11 Titanium costs $100, and Toast 11 Pro is $150. Owners of Toast 10 can upgrade to Toast 11 for $60, or Toast 11 Pro for $100. Owners of Toast 9 or earlier can upgrade to Toast 11 for $80, or Toast 11 Pro for $130. All upgrades take advantage of instant discounts (no rebates involved).